1. Heat ghee and fry the eggs for a while . Keep them aside . 2 . Add whole garam masalas and fry for a while . Add the onion -ginger paste . Cook well adding water little by little . Add the beaten yogurt . Cook well . 3. Add the milk and the eggs . After few minutes add the cream , salt , sugar and split green chilies . Cook until the desired consistency comes !! Sprinkle some keora water . 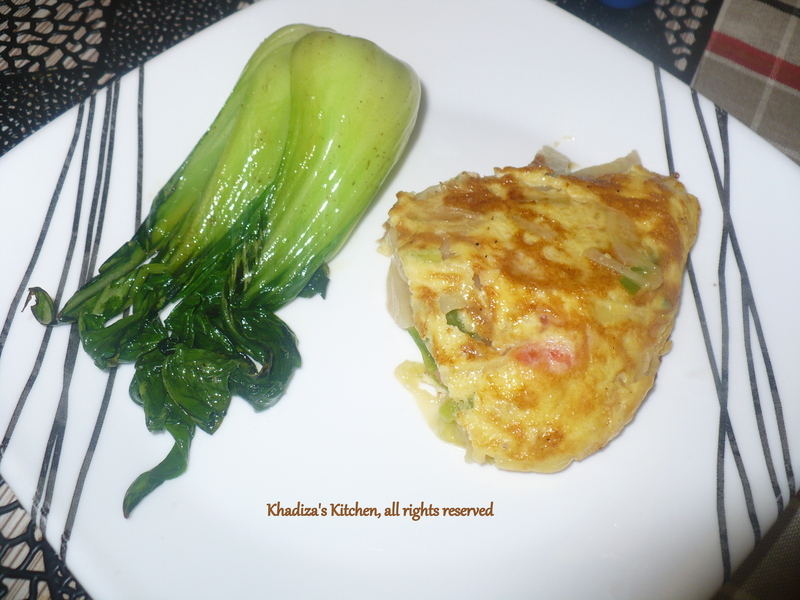 Tortilla de Patata / Spanish omelette , an improvised version of classic Spanish omelette. You may add crunchy beef fry , sausage, chicken, carrot in it . 1. Peel the potatoes and cut half lengthwise. Now slice them thin ( it would look like potato chips cut, but a little thicker than it). It is not necessary to slice the potatoes paper thin but try to make thin, should be like thick crisps. Rub them with salt. 2. Fry the potatoes in oil . The oil should be over potatoes. It’s not deep frying but you need more oil than usual. leave the potatoes in the pan until they are cooked . When it breaks into two , if u poke a piece of potato , it is done . It shoudn’t be crispy or burnt. Add the mushroom, onion, bell peppers into it . Fry for a while . Now drain the excess oil and let them cool. 3. Whisk the eggs , now add crushed black pepper , salt, the cooked potato, mushroom, onion, bellpeppers. Add chopped shrimp and tomatoes. Mix well but don’t break the potatoes. 4. Take a non-stick pan and wipe the pan with little oil . Don’t heat it too much , otherwise the omelette will be burnt at the bottom. The heat should be on medium flame. pour the mixture into the pan. Allow the egg to cook around the edges. Add the grated cheese if you like. With a spatula keep scraping the edges of the omelette. Reduce the heat of the stove a bit. When the bottom is done or it comes away from the pan if you try with spatula , its time for turn it over to cook the other side. Don’t try to do it with your spatula, it may break. So we are going to use a little trick here. 5. Take a plate and put it over the pan . Put one hand on the top of the plate and with the other hand hold the handle of the pan and flip over. So the omelette flips on the plate without breaking. 6. Wipe the pan again with little oil and transfer the omelette into the pan again and cook the other side on medium heat. 1. The smaller pan you take the more volume you will get . So always use small pan to have the volume and fluffy look. 2. People who are on diet or loves to eat healthy, they can always boil the potato instead of frying and may take 2 egg whites and 1 egg with yolk to make it more healthy. This is a fusion of two different recipes of my mom. 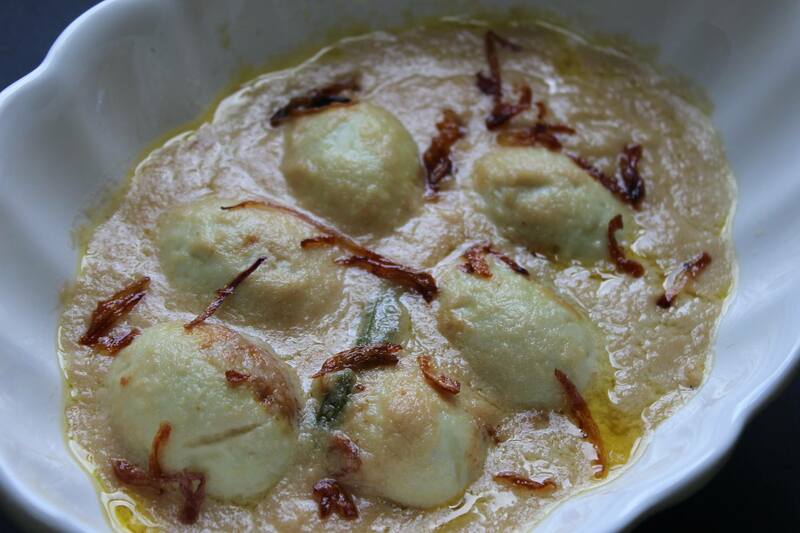 One is egg kofta and other is Wax gourd/ chaalkumra in coconut milk. Both are my favorites..I combined two recipes in one and it tasted too good. In original recipe my mom used to steam the egg mixture like pudding or flan. We used to call that JHAAl PUDDING or “Savory Pudding” . Then she would slice them and cook in gravy of our choice. 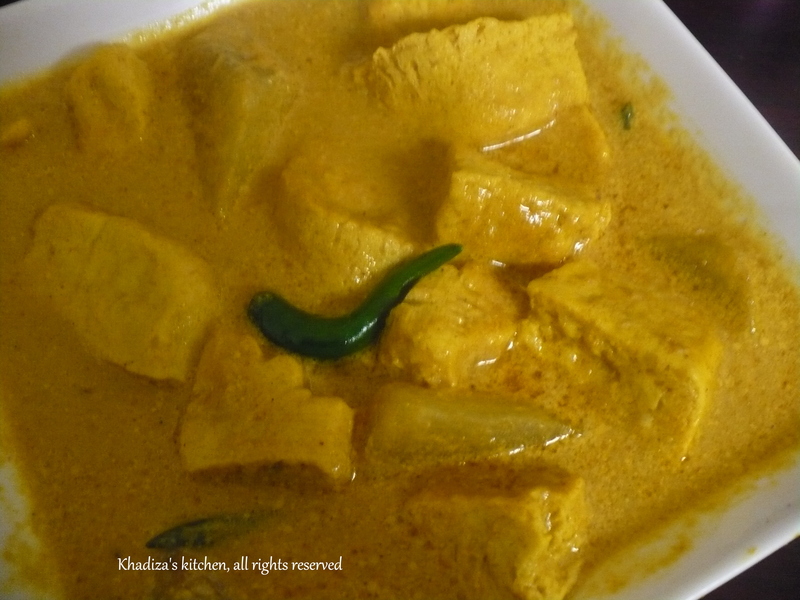 Sometimes in coconut milk, sometimes regular curry way. Here, I didn’t steam the kofta, instead I microwave them for two minutes. Huge time saving!!!!!!!!!!!! The whole preparation took me less than 20 minutes !!!!!!!!!!!!!!! I already posted microwave egg kofta curry previously. There I used cup for making Cup kofta, but today I gave it the original , authentic look. 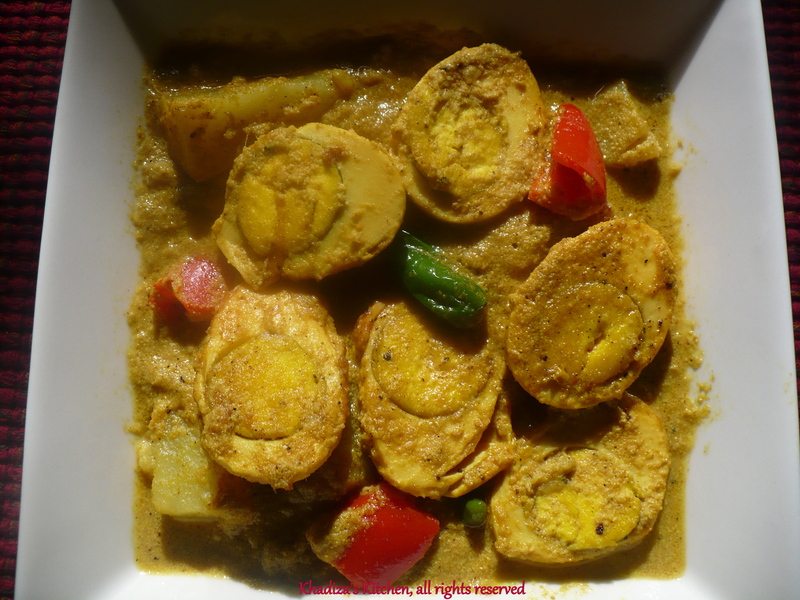 Here’s the link of my Microwave egg kofta curry..
Wax gourd or chaalkumra cut in thick square or cube. Cumin seed and cardamom- roasted and grinded together into a powder. 1.For Kofta beat 3 eggs and blend it with mashed potato ( half of one medium sized potato), little ginger-garlic paste, little turmeric powder, chili powder and salt. 2. Now pour some of the mixture into a greased square box. The kofta will rise up to the top of the box,so pour only half of the box at a time..Microwave for 2 minute or until done …You can also pour the mixture into a greased microwave oven proof dish and bake it like a cake.Then slice it and cook it in the gravy. In the original recipe it’s being poured into a mould and was cooked on steam like pudding. That is how it looks after slicing. 3. In the mean time fry the wax gourds in oil . Before frying , rub them with little salt and turmeric. Don’t deep fry them. Heat oil in another wok . Add bayleaf, Cinnamon and fry a little. Then add onion paste, ginger-garlic paste, turmeric-chili, coriander powder and salt..cook adding water little by little. Now add 2/3 rd cup of water and 1 cup of coconut milk.Add the kofta and gourd . Cover the lid.. 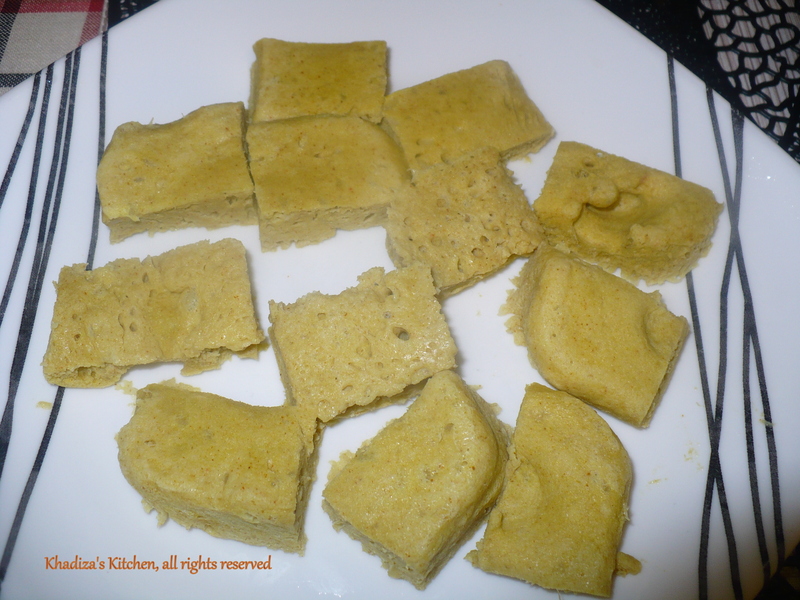 I used Maggie coconut milk powder . To enhance taste , I Mixed my coconut milk powder in regular milk while making the coconut milk. 4. Cook them on medium low heat. The koftas may expand a little, so make sure the gravy should go into the koftas..
5. Microwave Cumin seed and 2/3 cardamoms. Grind them into a powder. Add them into the gravy.Add some green chilies too. 6. Turn off the heat and let it be on the stove like that for 5/10 minutes with the lid on until oil separates. Enjoy with plain rice or pilaf/ Polau !!!!!!!!!!!! 1. Always use small boxes for thick volume of kofta. 2. When done, don’t try to unmold the pudding as it may break from the bottom. Just slice keeping them on the box and take out the pieces from the box. 3. Make sure the gravy goes into the koftas.